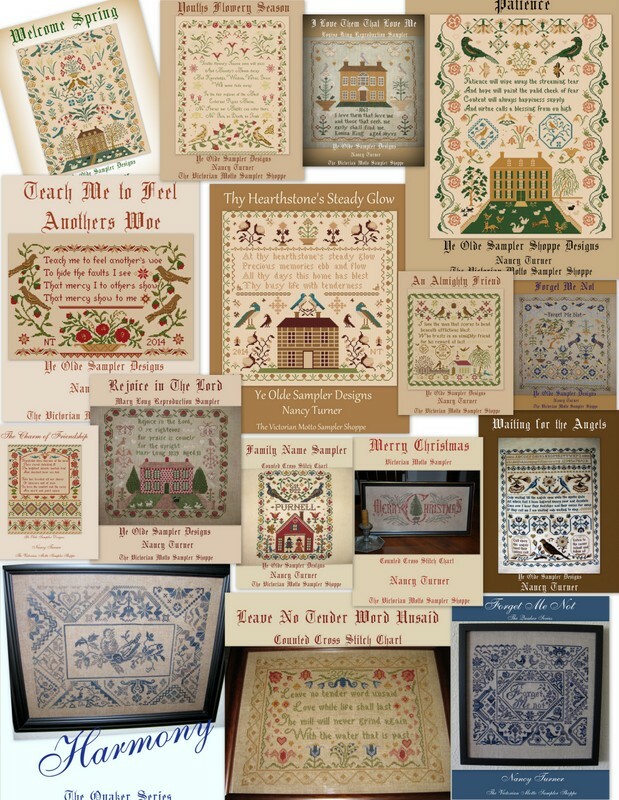 Victorian Motto Sampler Shoppe: Christmas in July Gift Certificate give-away, enter now! Christmas in July Gift Certificate give-away, enter now! What would a great give-away be without a gift certificate?? Lets give a couple away!!! $25 for you to select anything in my shop. You will browse my ebay store and then email your selections to me. Lets have 2 winners! Charts, floss, trim bags, grab bags, etc. Rules: same as usual. You must be a follower at the right. Click by Faithful Friends to follow. You must post a comment here. Post on your blog or facebook and get 50 more entries! I like to give a lot of people a chance to enter. I love Christmas in July!!!!! Drawing to be July 23rd. You must check back to see the winners of all the give-aways. I don't have time to hunt you down (lol) and you must follow! Hi Santa Nancy. What a wonderful and generous give-away. Thank you for the chance to win. I'm a follower Nancy and I've posted your most generous give-a-ways on my blog. What fun! Two lucky stitches will certainly have fun choosing their gifts! Thank you for all that you share. Please enter me, Santa Nancy! :-) I will post another comment if I get it posted to my blog. Very nice, gift certificates are wonderful! Oh wow! Another give away!! Please enter me for a chance and I am off to post on my blog as well! I WOULD LOVE TO WIN A GIFT CERTIFICATE. It would be fun to shop. Another fabulous giveaway! Please enter me and I did post on my facebook. What a special lady you are! Please include me in the drawing. Thank you Nancy! Thanks again for another wonderful chance! Another fabulous giveaway....you are wonderful Nancy! Oh what a fun gift to receive!!!! I LOVE shopping with Gift Certificates!!! Please include me in your drawing!!! Thanks again Nancy. please enter me. Will let others know on my blog. AMAZING GIVEAWAY!! Count me in for sure!!!!! I forgot how much fun Christmas in July can be. Great giveaway. Nancy P.
Thank you Nancy. I would love to be entered in your giveaway. Thanks Nancy, you are so sweet!!! I shared on Facebook, thanks for the chance!! Santa Nancy strikes again with another great giveaway! Please put my name in the pot. Thanks for being so generous! Das wäre schön, wenn ich gewinne ! Please enter my name in this one... How fun! Thank you for doing this. So much fun. What would I pick??? Posted on my FB page too. Thank you! Thank you for a chance to win! Will post on my Facebook flag. ilove your bags of trims!!!! Thanks for the gift certificate giveaways.....so many beautiful items to choose from. I'm posting on my FB page also. Thank you Santa Nancy this is so generous please include me I am posting a link on my blog! I'd be thrilled with any of your contests/ What's not to love! Thank you!! Krissy B. Thank you for the opportunity to win a gift certificate!! I would love to go shopping for your threads. Thanks for the chance. Thanks for the opportunity to win a gift certificate. You are so generous. Please enter me in your drawing and I posted on Facebook! Dear Santa Nancy, I love your designs! Thank you for a chance to win a great giveaway. Please add my name to this generous giveaway. Thanks for the opportunity to win something fabulous! It is on my blog too! Count me in please! Thanks so much for a chance at this give-away! Count me in this giveaway. Thank you Santa! What a beautiful rainbow. I adore embroidery. Thanks for the drawing Nancy! I'll look forward to it! Please enter me! You make July a month to look forward to. Would love to win some floss. Thanks so much Nancy. Thank you, thank you for another chance to win. Wonderful! Thanks for the opportunity. Count me in, too!!! Thank you. Thanks for the chance! I'm a follower here and just posted to my blog and FB page. This is a great giveaway! Thanks for another chance to win! Wow! Another wonderful giveaway! I'm one of your Faithful Followers! Such beautiful eye candy. Please enter me in your drawing. Another wonderful gift...generous as always. What fun to pick from such a vast array of wonderful pieces. Thank you. 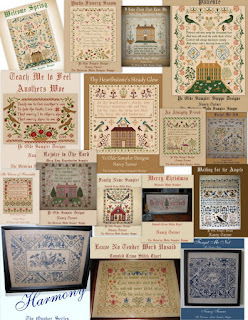 I know exactly which sampler I want if I am one of the winners, and thankyou for this generous giveaway. I will post on my facebook page. Hi Santa Nancy! Love when you dip into your Santa Sack and come out with wonderful gifts. I am one of your dedicated follower. Count me in and shared! Thanks Nancy! I'm in too! Will share on FB as well. Thank you for a chance at another of your wonderful giveaways! Count me in! Thanks for being so generous, Nancy! Hi Nancy, Count me in on your wonderful giveaway!! Thanks. Would love this one! Please count me in, thank you for another great giveaway! Will post on Facebook too. Oh yes please :) merry christmas in July! Love the opportunity to win a gift certificate, thank you so much! Finally posted the $25 gift certificate on my blog. Hope everybody gets a chance to win, you are so generous. Ofcourse I am dreaming about the next drawing on the 15th of July. Wow Santa Nancy is at it again. I would love to be the winner to this as I have an idea what I would pick out. But then again... there is that...and this what's over yonder too? Thank you Nancy in all the blessings that you share with us. Nancy I got the first patterns I ordered from you. WONDERFUL patterns....would LOVE to win one!!! Another generous giveaway! Thank you for the chance! A wonderful Christmas present Santa! How nice to be able to choose in your Christmas workshop! I am a follower and I have posted on Facebook! Thanks for the giveaway chance. Thank you, once more, Santa Nancy! A most generous offering! Please enter me in this generous giveaway! Love everything! Please enter me again in your give-away! Thank you! Please enter me. I love Christmas in July. Your threads are beautiful. Thank you. Please add my name to the hat for this drawing. I would have lots of fun trying to pick what to get - you have so many wonderful things to choose from. Merry Christmas-in-July! I'd love to win this giveaway! Your patterns are awesome! GFC follower: nicolesender. Your patterns are so pretty! What great giveaway. Floss, fabric, patterns. trims - just wonderful. Hi Santa Nancy! You are so generous, fabrics, floss, & patterns! I love it all! Please enter me in your drawing. I am a follower. I really do not know whether or not I have already entered this drawing. Nancy, I would do almost anything for your threads.